Yesterday on the SkyTrain I saw an ad for a new Samsung Store, the first in Canada, now open in the Metrotown Mall. Today I went to have a look. The Metrotown Mall is only a ten-minute walk from where I live, so I wasn’t going out of my way. 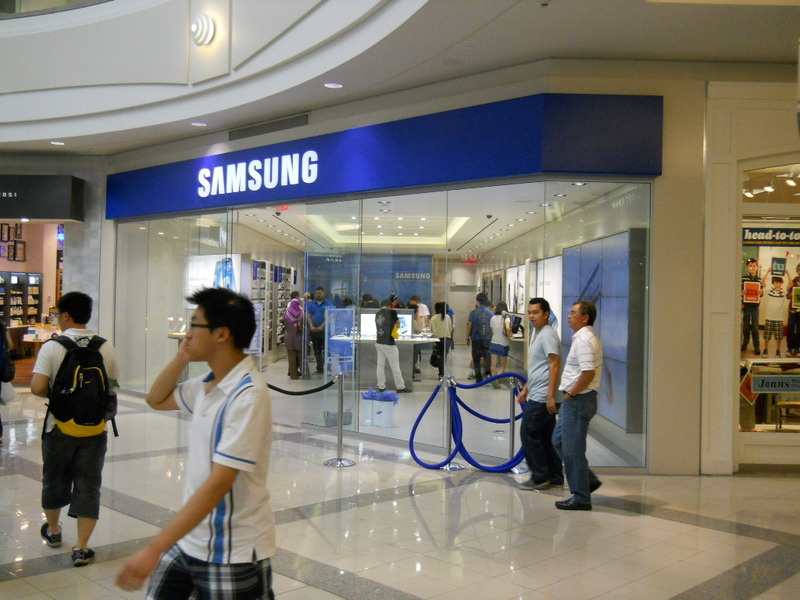 It’s the biggest shopping mall in BC; I guess that’s partly why Samsung started there. (Technically, the mall is the “Metropolis at Metrotown,” but I don’t know anybody who calls it that.) Burnaby also has a big Korean community, so that might also be part of their reasoning. I didn’t take any photos inside the store because I didn’t want to get in trouble. There were a few big tables in the middle. The one nearest the door showcased the Samsung Galaxy S III (smartphone), which has gotten rave reviews and I’ve heard is selling really well. The other tables showcased the Galaxy Note (smartphone) and the Galaxy Tab (tablet). Each table had about six example devices, and each one had an associated tablet which gave the specs. I didn’t buy anything. The Galaxy S III was about $150, but only if you got it with a three year plan. I didn’t ask for details. It’s interesting to see Samsung setting up their own retail stores. I’m not sure why they think they need them. They already sell loads of consumer electronics through their existing retail partners. Maybe it’s a marketing move, to make Samsung a more visible brand, and a more obvious competitor to Apple. If so, I think this new store does that well.